George Joseph Herriman (August 22, 1880 – April 25, 1944) was an American cartoonist best known for the comic strip Krazy Kat (1913–1944). More influential than popular, Krazy Kat had an appreciative audience among those in the arts. 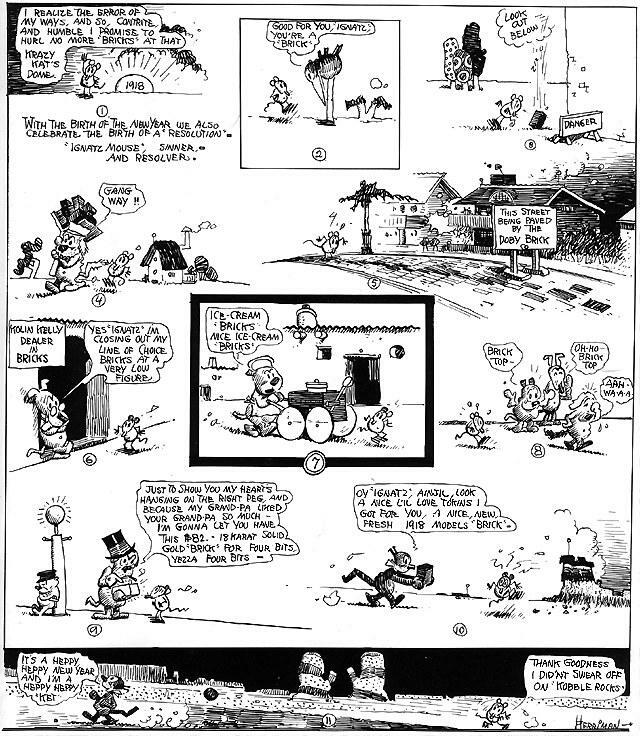 Gilbert Seldes' article “The Krazy Kat Who Walks by Himself” was the earliest example of a critic from the high arts giving serious attention to a comic strip. The Comics Journal placed the strip first on its list of the greatest comics of the 20th century. 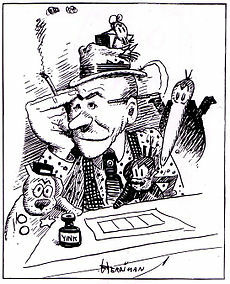 Herriman's work has been a primary influence on cartoonists such as Will Eisner, Charles M. Schulz, Robert Crumb, Art Spiegelman, Bill Watterson, and Chris Ware 1). Herriman was born in New Orleans, Louisiana, to mulatto Creole parents, and grew up in Los Angeles. After he graduated from high school in 1897, he worked in the newspaper industry as an illustrator and engraver. He moved on to cartooning and comic strips—a medium then in its infancy—and drew a variety of strips until he introduced his most famous character, Krazy Kat, in his strip The Dingbat Family in 1910. A Krazy Kat daily strip began in 1913, and from 1916 the strip also appeared on Sundays. It was noted for its poetic, dialect-heavy dialogue; its fantastic, shifting backgrounds; and its bold, experimental page layouts. In the strip's main motif, Ignatz Mouse pelted Krazy with bricks, which the naïve, androgynous Kat interpreted as symbols of love. As the strip progressed, a love triangle developed between Krazy, Ignatz, and Offisa Pupp 2). Herriman lived most of his life in Los Angeles, but made frequent trips to the Navajo deserts in the southwestern U.S. He was drawn to the landscapes of Monument Valley and the Enchanted Mesa, and made Coconino County the location of his Krazy Kat strips. His artwork made much use of Navajo and Mexican themes and motifs against shifting desert backgrounds. He was a prolific cartoonist who produced a large number of strips and illustrated Don Marquis's books of poetry about Archy and Mehitabel, an alley cat and a cockroach. Newspaper magnate William Randolph Hearst was a proponent of Herriman and gave him a lifetime contract with King Features Syndicate, which guaranteed Herriman a comfortable living and an outlet for his work despite its lack of popularity 3).